The Subie was put out to pasture last Saturday. I needed a bit more cargo capacity but didn't want a Minivan nor poor fuel economy. 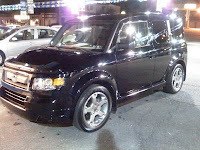 Honda Element SC. Today I did a round of dealer visits in my home state/eastern portion. It's comfortable for my 6'4.5" frame, can easily fit two large bike frame bike boxes in the rear with the seats folded up. It handles like a go kart, the springs sit the vehicle 3/4" lower than the stock Element EX and has 18" rims. It's a firm ride but I like that better than driving a wallowing buffalo.